For starters, Roices Naguit has been in the business for almost 15 years now. She has been with TV5 — then known as ABC-5 — since 2003, beginning as a junior writer for newscasts such as Sentro, The Big News and Balitang-Balita. "Whatever I know now, I owe to my experiences writing for these newscasts. It enhanced not only my writing skills but also my editorial judgment," she said. In 2006, she would join the network's on-air team by accident after one of its newsbreak anchors failed to show up one Saturday morning. "Looking back, I think I should be thankful that it happened because that actually started it all for me," she said. Soon after that, the powers that be at the network would appoint her as a general assignment reporter, tasked to cover stories such as crimes, fires, protest rallies, demolitions, calamities, among many others. She would also be assigned to various beats — defense, security, Senate — from 2006 to 2009 before becoming part of the Malacañang press corps a year later after then-Senator Benigno "Noynoy" Aquino won the presidency in 2010. "When he won the race, I was automatically assigned to Malacañang," she said. "I basically covered President Aquino wherever he goes, both with his domestic and international affairs." 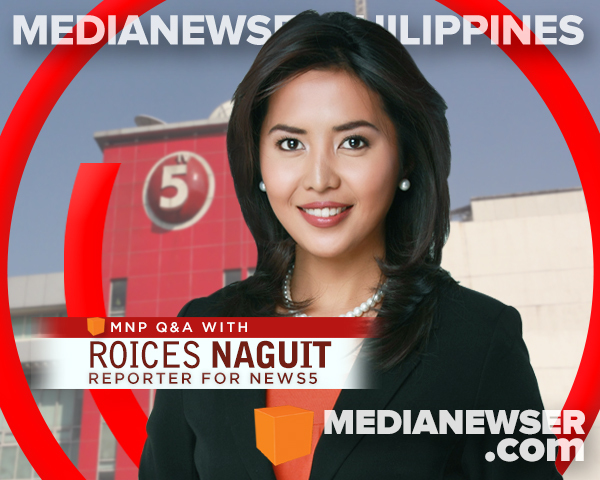 Now a Congress beat reporter, Roices also anchors the Sunday edition of TV5's news bulletin, Aksyon Alerts. She also occasionally guest anchors Aksyon Tonite, while also filing reports for the business news channel Bloomberg TV Philippines. For our first MNP Q&A for 2017, we profile one of TV5's last remaining journalists. Here she talks about her more than a decade career in the business, her experience covering former President Aquino, and her plans and hopes for the future. Be sure to join the conversation below or on our Facebook page. You can also tweet us @medianewserphil. Guiding Principle: God is always in control. Let's have an introduction. Who is Roices Naguit both on- and off-cam? On-cam, I am an observer. Not much of a talker but I'm a listener and very particular with details. Most people say I look too serious on TV. I’m also not very fond of press conferences, because for me, ambush or one-on-one interviews always give the best answers. I prefer to do my own interviews and stories most of the time. Off-camera, I am a proud mom of my 11-year-old daughter. I'm affectionate but still strict. I'm also a simple person with simple dreams, old-fashioned or classic (to be cool about it). I love my peace and I keep a very few close friends. One thing I love to do is eat. [Laughs.] Proud Kapampangan here! I really do have high standards when it comes to food. And yes of course, I can cook a few good dishes. 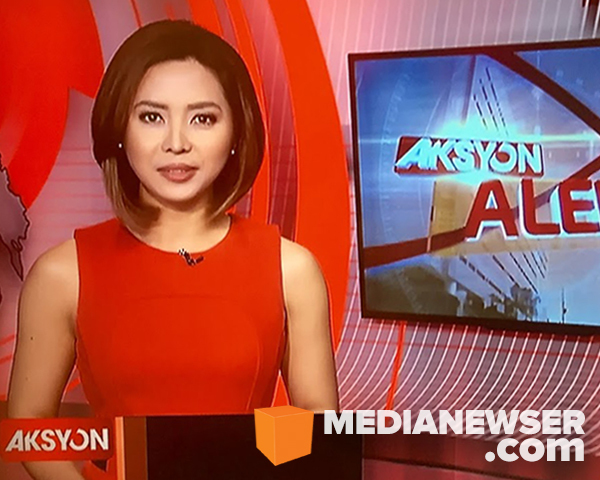 Roices anchoring TV5's news bulletin Aksyon Alerts. To be honest, being a broadcast journalist was far from my mind when I was young. I was too shy and I used to have fear talking in front of other people, even in class I should say. It was my father who encouraged me to take up Mass Communication. I wanted to be a flight attendant or a lawyer back then, but I have no regrets. Being in the broadcast news industry is among the best things that ever happened to me. I love my job and I believe this is where I truly belong. What is journalism for you? Also, how would you define a real journalist? For me, journalism is a noble profession. It's very exciting but stressful at the same time. It takes a lot of passion, patience, determination and strength to be really good at this job. Journalists, I believe, are like public servants with no vested interest whatsoever in the stories that we tell. We serve the public by giving them accurate, impartial and right information on important events that happen in and outside the country. It is never easy, because whatever we write and report will always have an impact on other people’s lives. A real journalist for me is one who has genuine love and concern for news and the people who rely on us in telling the real story behind every story; one who is willing to go the extra mile to give the right and much needed information without compromising principles and values. This profession, by the way, will not make you rich, but I still love it. You started your career as a writer for newscasts such as The Big News, Sentro, and Balitang-Balita, then eventually as producer for other ABC-5 broadcasts. What were those experiences taught you? Whatever I know now, I owe to my experiences writing for these newscasts, It enhanced not only my writing skills but also my editorial judgment. It even came to a point when I was the only writer for one newscast. Writing for news requires one to be responsible. You have to write with passion because in your mind you know that whatever you write could affect the lives of your viewers, one way or another. It is also important to be accurate at all times. I am forever thankful to our original producers, Sonny Fernandez and the late Sir Vic, Sir Deo, Ms. Anne, and also to our former VP for News Joe Javier. 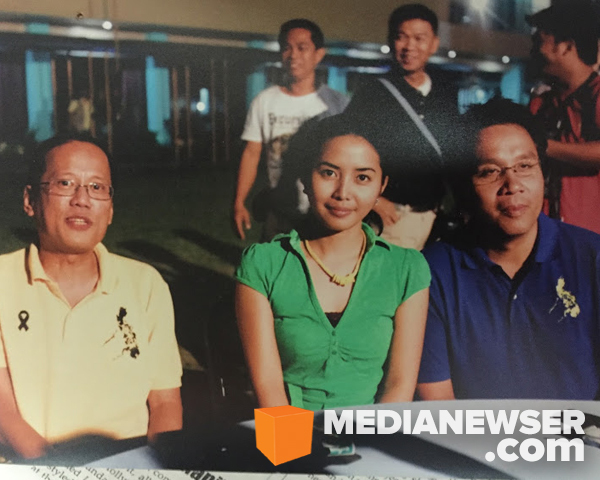 As a Malacañang beat reporter for TV5, Roices followed former President Benigno "Noynoy" Aquino for six years. After some time you became a general assignment reporter for ABC-5. Walk us through your early days as an on-cam talent for the network. As far as I remember, I started doing on-cam work or newsbreaks when I was still a news writer. There was one Saturday morning when the anchor didn’t report for work and I was tasked to do the news. Plus, I was also the producer, writer and video editor on that day. Looking back, I think I should be thankful that it happened because that actually started it all for me. 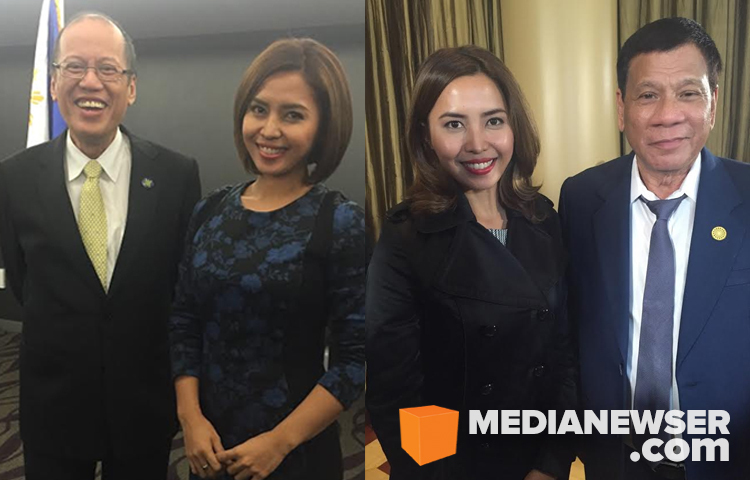 I started as a pinch-hitter for newsbreaks, and after a while they also made me fill-in for Cherie Mercado for The Evening News with now PCOO Secretary Martin Andanar, and also for Maricel Halili for the weekend late-night newscast. From being a junior writer, I was promoted as a junior reporter. There were actually five of us news writers who were deployed on a weekly basis for field training. That was due to the lack of manpower or news teams at that time, and the bosses wanted to get someone from the ranks. I was the youngest then and was lucky to have been chosen. I started as a roving reporter, meaning strike anywhere. I covered crimes, fires, protest rallies, demolitions, calamities and so on. I remember my first day on the field, I came back with two packaged voice over stories. But sorry, I already forgot what those stories were. My first live report was unforgettable not because it was my first, but because it was about the death of our news team who died in a vehicular accident in Bicol. "We did our job the way it’s supposed to be done, without being bashed by the President [Aquino]'s supporters if the stories weren’t 'favorable' to the administration." Eventually, our production boss, Patrick Paez, gave me Aksyon Breaking Sabado on Aksyon TV. I was also the producer of that newsbreak slot. In addition, I was also part of our public affairs shows Dokumentado and Anggulo. Currently, I'm doing Sunday Aksyon Alerts. 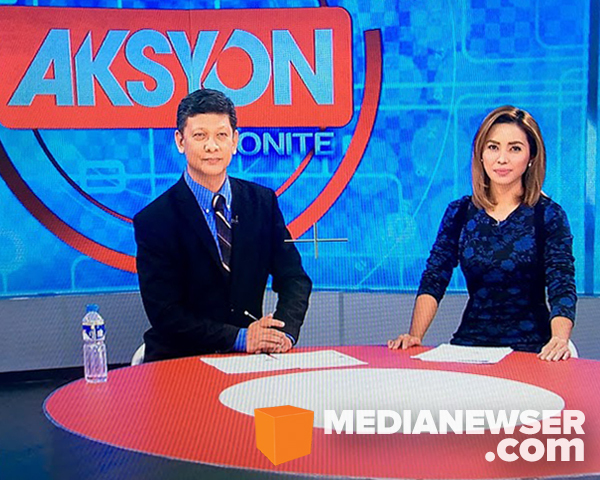 Recently, I was given a rare opportunity to anchor our award-winning late night newscast Aksyon Tonite for over a week. With Aksyon Tonite anchor Ed Lingao during her recent week-long stint on the TV5 late-night newscast. Eventually you would be assigned to cover the defense and senate beats. What did you learn from those experiences? When I covered the defense beat, I was exposed to the military world so to speak. I became aware of how the military acts and speaks during extra-ordinary situations; how the generals and their men respond or try to cover for what exactly was happening in the field. That was also the time Magdalo was being tried for rebellion and their coup attempt. Also, I was able to establish contacts with some of those senior officers in the military who eventually became appointed officials in the government. But among the most memorable coverage was the visit of then-Department of National Defense Secretary Gibo Teodoro at the Pag-asa Islands in Spratlys. Covering the Senate beat made me become critical as a journalist. That was where I have learned to understand Philippine politics better. Journalists could be used by some politicians if we are not careful and cautious. With then-presidential candidate Noynoy Aquino and vice presidential candidate Mar Roxas during a campaign stop in Zamboanga in 2010. You've covered Malacañang for 6 years now. Tell us about that experience. I covered then-Senator Noynoy Aquino’s presidential campaign in 2010. When he won the race, I was automatically assigned to Malacañang. I basically covered President Aquino wherever he goes, both with his domestic and international affairs. Most of the time, I stayed in the press office and covered the regular press conferences of his spokespersons. Covering the President had so many restrictions and at first I tried not to follow the rules and did my own thing, but eventually you really have to follow the protocols, and that, at times, is frustrating. "A real journalist for me is one who has genuine love and concern for news and the people who rely on us in telling the real story behind every story." As someone who followed PNoy during his term, how would you describe his relationship with the media especially the Malacañang press corps? Also, what would be your most memorable coverage of the former president? It was more of a love-hate relationship. PNoy was accommodating to MPC, especially to those he personally knows. Sometimes, he would agree to do ambush interviews with reporters waiting for him. We always had at least one ambush interview per week, whenever he was out of town and out of the country. But PNoy was also very vocal in expressing his disappointment with the media for not writing or reporting "the good news." The most memorable for me was the 2010 Presidential campaign. I personally witnessed how reluctant he was at first, and how it had changed when he saw how the people welcomed him with much hope and warmth in almost all the places he visited. I guess, it was because people saw him as someone who could bring about real change at that time coming from an administration that was perceived to be tainted with corruption and anomalies. During his presidency, I think the most memorable was covering his first U.S. trip and attendance to the United Nations General assembly, his first encounter with then U.S. President Barack Obama, and also his visit to their residence in Boston. With PNoy during his last U.S. visit for the US-ASEAN Summit in Sunnylands California in February 2016; and with President Duterte during the APEC Summit in Peru in November 2016. How would you compare the previous administration to the current Duterte administration, coverage-wise? So far, I only covered President Duterte once and that was during the APEC Summit in Peru last November 2016. So, I really do not have enough basis for comparison. His administration is just starting and his people are new so it is expected that things would always be not as organized as one would hope. During the Aquino administration, coverage then was relatively smooth, predictable and organized. There were only two spokespersons alternately speaking for the President. Statements or reactions either by the President or his spokespersons to issues were always issued late because as they say they need to get all the facts, know the context, verify, and assess before giving any comment. Overall, I can say that media life during the Aquino Administration was “normal,” meaning we did our job the way it’s supposed to be done, without being bashed by the President’s supporters if the stories weren’t “favorable” to the administration. How would you respond to accusations that the mainstream media has been biased against Mr. Duterte especially with how they cover him? Biased? I don’t think I would want to dignify that observation because I know where that is coming from. Journalists only report what is being "said" and “done” by the president and we never include our own personal opinion in our stories. "With the technology nowadays, it has become very competitive and challenging. Access to news is wider and faster because of several social media platforms out there." Last year's election has been described numerous times by political experts as the most divisive and vicious elections in modern history. As someone who has covered these last three elections how would you describe the 2016 elections? For me, the 2016 election was a game-changer in our political history. At first nobody expected that a reluctant, local executive would eventually win. The other “stronger” candidates got too busy throwing mud against each other that they did not probably realize that voters are too tired of that. This last election also proved how powerful social media can be. Unfortunately, it was also used as a very effective tool for black propaganda and mudslinging. It was also perceived as divisive because of the “elite” VS. the “masses” supporters of the candidates. Since you mentioned social media, how would you describe the current media landscape? With the technology nowadays, it has become very competitive and challenging. Access to news is wider and faster because of several social media platforms out there. The disadvantage though is the proliferation of fake news websites and misinformation that sometimes make other people question which among the “news” is real. You've done many reports and had been to many places, what would be the most unforgettable coverage for you, and why? I covered historical events, like the Papal visit in 2015, the state visit of President Obama, the 2010 and 2016 Presidential elections, calamities, controversies, and so on. But the only story that’s really unforgettable for me until now was that of Niño, a grade 1 student who I covered during his first day in school. His story made me realize how many other poor families struggle to send their children to school. Niño wore hand-me-down uniforms of his siblings, old slippers, and one pencil in his pocket, no notebooks, no school bag. He had coffee for breakfast and walked his way to school. With no money in his pocket that day, he opted to take a nap during recess while his classmates bought snacks. I could only watch him from outside the classroom window. I tried to reach out to him and his family after that day to help, but I wish I could have done more. Covering PNoy's working visit to Washington D.C. in 2011. What do you consider the highlights of your career so far? The 2010 Presidential campaign really started it all for me. The highlight being the first ever live interview granted by then President-elect Noynoy Aquino right after his proclamation in Congress in 2010. I should say it was followed by my 6 years in the Malacañang beat, covering not only the President but also having to cover other important and historical events and also international coverages like APEC, ASEAN and WEF summits in different parts of the world. And of course, my anchoring stints for our main newscasts. Who's your favorite interviewee, and why? Also, who do you want to interview next? I always like interviewing ordinary citizens. But among politicians, I'd say it’s still PNoy during the time that he was campaigning. But I also would like to have an opportunity to interview President Duterte. You were given a chance to become part of a news magazine program Anggulo in 2010. Tell us about that stint. I am truly privileged and proud to have been part of Anggulo, mainly because I was hosting alongside our boss, Luchi Cruz-Valdes. And of course, it was something that I have always wanted to do, to report something unconventional. With Anggulo, we tried to show the other side of the story. It mainly focused on personalities and what people don’t know about them yet. It was exciting but the challenge there was time because we all have our regular reportorial duties. What is your day-to-day life like? Could you share to our readers more about your life behind the camera. Basically, it’s just home-work-home for me. In the morning, I see to it that I have breakfast with my daughter before I leave for work. The whole day I would spend in Congress, covering congressional hearings, press conferences and ambush interviews in between, and session at 4PM. Session usually adjourns between 7 to 8PM. I usually file my reports from Congress so I don’t have to go back to base, thanks to iPhone voice recorder. After work, I just go home and spend time with my daughter, watch the news, and sleep by 10PM. "I’ve been with TV5 for almost 14 years now. I hope that in the near future I would be the next Cheryl Cosim or the next Luchi Cruz-Valdes." How do you manage to do that — balancing your work and family life? For a solo parent like me it’s really hard to balance everything, especially because my job demands longer working hours. I just see to it that I spend quality time with my daughter and do things that she loves to do whenever possible. Personally, I consider my biggest success is the fact that I raised a good, kind-hearted daughter especially in this day and age. Professionally, I have yet to achieve my biggest success but I think for now, I also consider myself successful for staying in the industry for almost 14 years now, being recognized for my work and professionalism and being given career breaks by my company. And disappointment, if there is? Looking back, I think I should have been more aggressive in this profession and pursued studies or trainings that could further enhance my knowledge and skills as a journalist. During her temporary anchoring stint on Aksyon Tonite. As a broadcast journalist, how do you define and measure success? 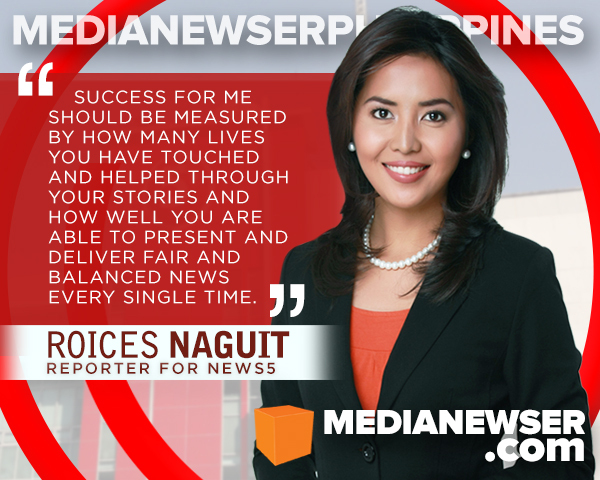 Success for me should be measured by how many lives you have touched and helped through your stories and how well you are able to present and deliver fair and balanced news every single time. It should not be measured by how well you look on TV or how many followers you have on social media. For me what matters most is to be recognized for integrity and reportorial quality. Who do you look up to in the business and why? Luchi Cruz-Valdes, Sandra Aguinaldo, Kara David, Nadia Trinidad, Pia Hontiveros and Che-Che Lazaro. All of these ladies, I know. But I really admire the way they ask questions, write and present their stories, and how they project themselves on- and off-cam. Most of them I know personally and I admire them even more for their kindness and dedication. What's your hope for the future? What do you want to do next? I love doing what I do now — covering, writing and reporting the news. And I couldn’t imagine myself doing something else. But someday I also hope to contribute more to the company. I’ve been with TV5 for almost 14 years now. Last year, I was fortunate enough to be considered for a temporary anchoring stint in one of our major newscasts, Aksyon Tonite. Of course, I hope that in the near future I would be the next Cheryl Cosim or the next Luchi Cruz-Valdes. Someday, I also hope to become a news manager, either production or operations since I already have experience and knowledge in both. Outside the industry, I am hoping to start my own business in the near future. With what's happening over at TV5, do you see yourself staying there for the next 5 years? I would like to believe so. I’ve been here for over 14 years now. This is where I got my first job, the first company that trusted me and it’s just right to give them my loyalty for the next 5 years, unless my bosses tell me it’s time to go. What would be your best advice to those who might want to join the television news industry? This job requires passion, not fashion, fame or fortune; sorry but this is not a high-paying industry. News is never about us, but the people who rely on us for the most needed information. Whatever we report could and would always have an impact on people’s lives so we always have to be accurate, factual, balanced and truthful in presenting the news. Also, If you really want to be in this industry, consider yourselves as public servants (minus the vested interest of some politicians). I think it is also important to say that it’s okay to be different and innovative, and do not go where everyone else go to gather news. Lastly, always be humble, be curious, and be fearless.